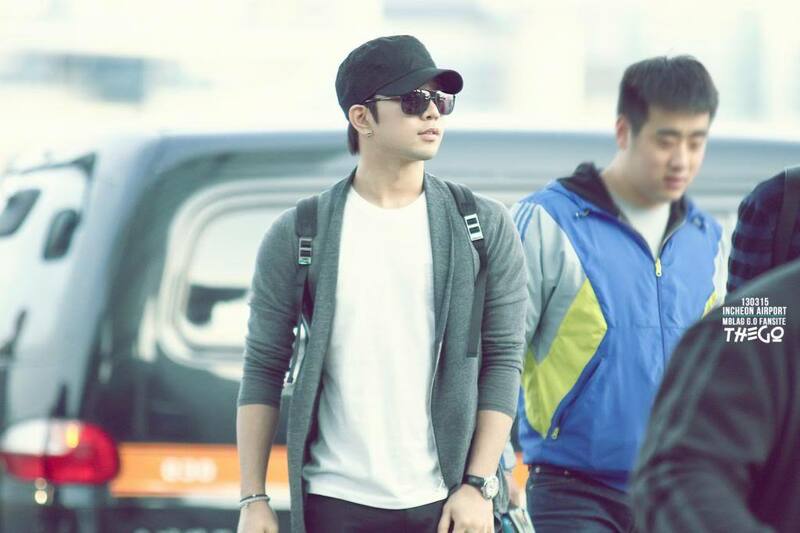 I cannot believe I have let 16 months pass without taking a moment here on the Countdown to admire G.O’s airport style. Well, I did touch on it a little bit back on Days 155 and 202, but overall have not done so with regularity. With the plethora of pictures and cams that exist of any one of the many arrivals and departures from airports worldwide that are available, you would think I would have included more of those moments in the Countdown by now! Well, there are 257 more days left to G.O’s service so now is as good of a time as any to to make it a reoccurring sub-category in the mix. When is G.O not stylish? He always looks fabulous whether he is dressed casually or more formal. Clothes just love this man. His airport style has been consistently comfortable with a touch of something (an accessory, a hat, sunglasses, or shoes) that adds a little extra dazzle, glamour and allure. Such was the case back on 13 March 2013 when the men of MBLAQ were en route to Thailand. Check out how comfortable this ensemble is from the loose fitting white t-shirt and cozy soft grey zippered sweater to the clean lines of his black twill cotton trousers. And then, all of the sudden . . . those shoes! I LOVE THOSE SHOES!! G.O makes color coordination in his style look so natural and balanced. He clearly takes notice of accessorizing, don’t you think? Right down to the black strap of his watch and black and white beaded bracelets. He rounds out his look with the black messenger cap, sunglasses and even, a black backpack. The organizer inside of me adores the balance of this look. The fangirl in me tries to catch her breath over how handsome he is. That is a never-ending losing battle as G.O is effortlessly handsome in every way on any given day no matter what he is wearing. 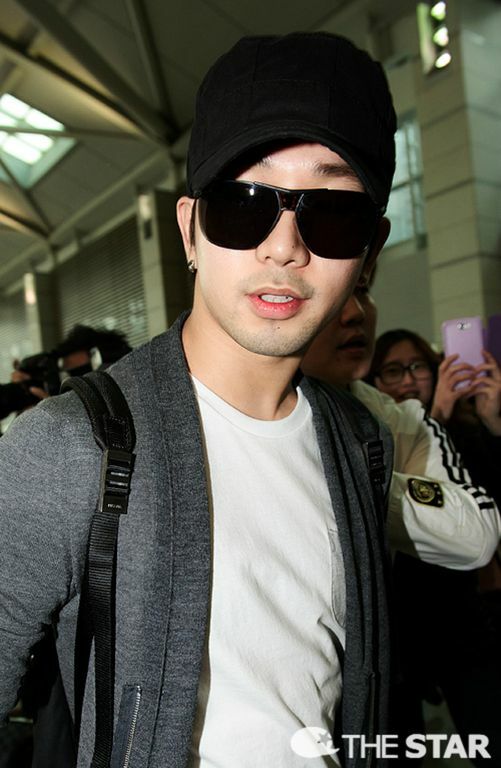 I look forward to regularly visiting G.O’s airport style again in the coming days. You know, there are only eight months left of his service. I cannot believe how quickly time continues to move. And, since I have not said it in a good long while, to all who drop by here, thank you. Thank you for continuing to indulge my passion to honor G.O. I am thrilled you return to read about him and fangirl with me! Please continue to support him ~ he will be back very soon! Categories: G.O Military Discharge, MBLAQ Musings, The G.O Files | Tags: G.O, G.O images, G.O's Airport Style, G.O's Style, 정병희, 지오, Jung Byung Hee, Jung Byung Hee images, MBLAQ G.O, MBLAQ G.O images, MBLAQ G.O's Airport Style, MBLAQ G.O's Style | Permalink.